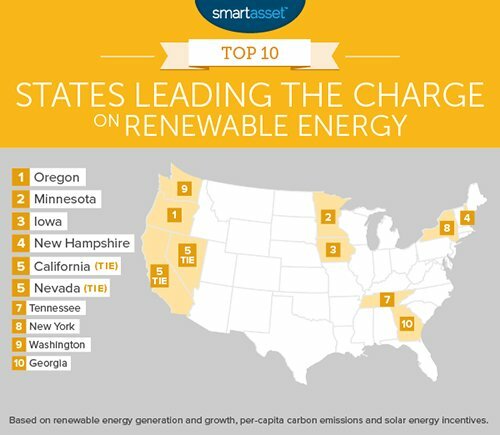 New Hampshire is among the states leading the charge on renewable energy, according to personal finance software company SmartAsset. Using data from the federal Energy Information Administration, SmartAsset said it aimed to produce a picture of the country for potential homeowners interested in installing solar panels on their roof or purchasing green energy packages from utilities. Overall, New Hampshire ranked fourth in the nation, said SmartAsset. The rankings were based on renewable energy generation and growth, per-capita carbon emissions and solar energy incentives. “Looking at numbers for New Hampshire, one thing that stands out is their solar incentives score,” said Nick Wallace, data editor for SmartAsset. New Hampshire ranked 13th out of 50 states and Washington, D.C. for renewable incentives. According to the Business and Industry Association of New Hampshire, New Hampshire offers a renewable energy property tax exemption, solar rebates up to $2,500 for residential projects and up to 25 percent of the total project cost for commercial and industrial applications. New Hampshire ranked 11th in ratio of renewable output to consumption, 13th in growth in ratio and 2nd in change in per-capita carbon emissions. Renewable-friendly Vermont ranked 14th overall, 10 places behind New Hampshire, but Wallace said that was because the Green Mountain State had set the bar so low that there had been little growth in recent years. Wanting to highlight trends, Wallace said the report focused on states demonstrating growth. That being said, New Hampshire ranked 25th in five-year growth output. In terms of the rest of New England, Massachusetts ranked 17th, Maine ranked 32nd, Connecticut 40th and Rhode Island 49th. Oregon ranked first, mainly due to hydroelectric power, which has been a controversial issue in the Granite State. Wallace was not aware of Eversource’s proposed project to build lines that would carry hydroelectric power from Quebec through New Hampshire. About 44 percent of Oregon’s total output is hydroelectric, though the state also relies on wind and solar. “Two big growth areas are solar and wind, and different states have seen growth in one or the other,” said Wallace. Wallace said renewable energy adoption is a good mix between homeowners and companies getting more of their power from solar arrays. “If you look at just the amount of renewable energy produced across the country, it has been skyrocketing in recent years,” said Wallace, who cited California’s renewable output is up 25 percent and Colorado’s up 48 percent. While Nevada did pass a law that charges homeowners with solar panels a fee, Wallace foresees continued government support. “For the most part we didn’t see much pulling back of these various incentives,” he said.